New Mining and Subsidence Report from Landmark. Landmark are launching a new Mining and Subsidence Report to update and replace two existing reports. The new report will combine and replace the Homecheck Ground Stability Report and the Subsidence Risk Rating Reports. The price will stay the same as the old Ground Stability Report that it replaces (£20 + vat). Subsidence and other types of ground instability can cause extensive damage so it should always be considered as part of the conveyancing process. As well as identifying any natural and man-made hazards in the area, the report identifies insurance claims that are a result of damage caused to nearby properties from subsidence – ‘real life’ evidence of the potential hazards identified in the report. This new report is available from the 1st September. 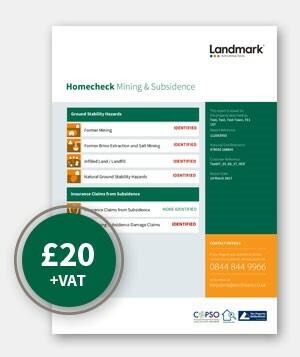 New Landmark Homecheck Mining & Subsidence Report. Search Alerts will warn you if a potential mining or subsidence risk has been detected when you enter an address and the appropriate report will be recommended. The Mining and Subsidence Report provides you with a clear professional opinion and next steps, allowing you to copy and paste into client documentation. The report is split into two main sections. 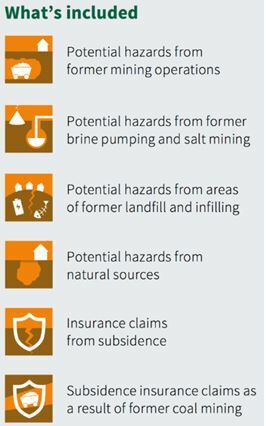 The first identifies the main types of hazards that could affect a property such as former mining, former brine extraction and salt mining, landfill and other infilled land, and natural ground instability hazards. A risk rating based on the number of valid subsidence insurance claims in the property’s postcode is provided. Claims made to the Coal Authority associated with suspected damage to property from coal mining in the area are also included. This feature provides evidence of the actual impact of a risk, thus providing a more complete picture than hazard data alone..
We offer a comprehensive range of property searches, defective title insurance and compliance services for the conveyancing professional. Established in 2008, our award winning platform is recognised for an innovative approach that helps improve efficiency, support risk management and lower costs. Our unique service provides you and your client with the most comprehensive risk screening available. Properties are screened against 24 potential risks with results shown in a clear traffic light display. Searches are recommended where potential risks have been found. A Property Screening Report is produced for your client to demonstrate the depth of risk screening. Useful information helps you make informed choices and act in the best interests of your client. Turnaround times are updated daily and live tracking of all searches ensures you know exactly what is happening on all cases. The freehold boundary of the property or land, as registered with HM Land Registry, is automatically drawn for you. You are free to upload your own plan, amend the freehold boundary or accept the Land Registry boundary as it is. Our Boundary Mapping Service is completely free of charge. Electronic integration with search providers ensures faster search ordering & delivery. Local Authority Searches are ordered in-house for better control and query handling. Real time search tracking gives an accurate picture of when you can expect delivery of your searches. A unique discount calculator applies a bundle discount of up to £25.00 against all multiple search orders. This gives complete flexibility to build your own search packs and ensures a search pack discount is always applied. Pre-configured search packs are also available with National Search Packs starting from as little as £99.00 plus VAT.